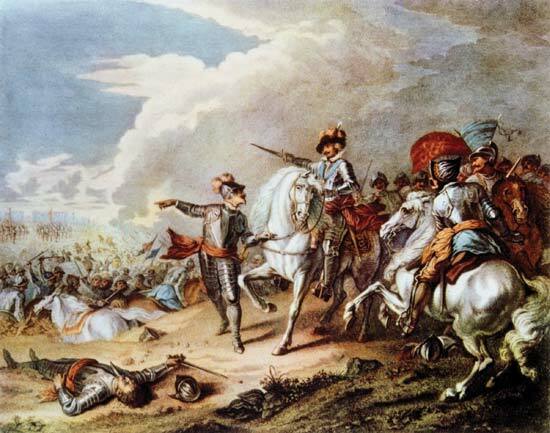 During the English Civil War (1642-1651), a client came to Lilly’s office asking for news about his brother, who had left London several weeks ago in order to go into the West of England, towards the front, where the parties were fighting. As there had been no news from him, the man was very worried fearing his brother might have been taken prisoner or even have died. Technically, this is a missing person chart, as Lilly was asked the whereabouts of the querent’s brother. Is my brother alive? If dead, had he been killed by soldiers? If he is alive, when will I receive his news? When will my brother come home? 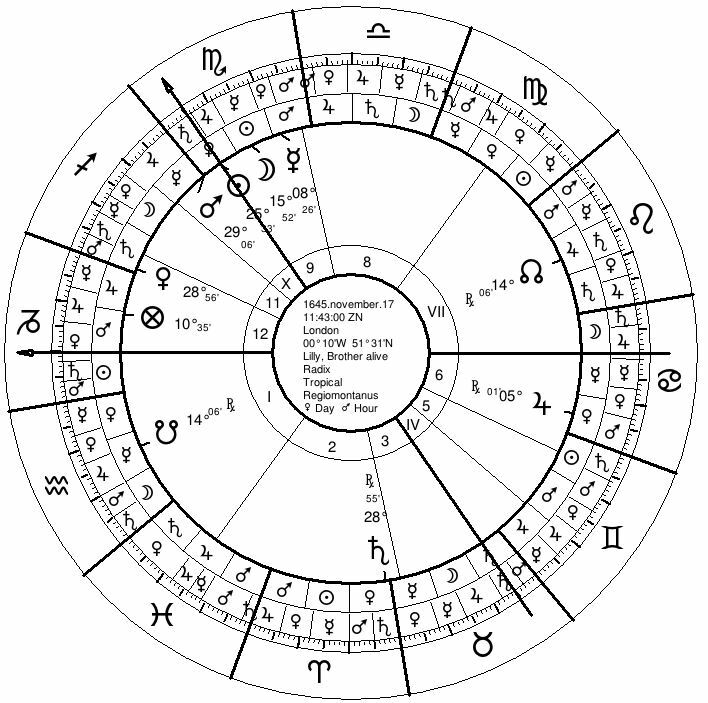 The querent is described by the AC in Capricorn and the AC ruler Saturn. Capricorn is an earth sign and thus cold and dry. Saturn symbolizes the same qualities. Both factors depict the querent to be lean and of middle stature. Lilly says, the client was a “real saturnine type”, which means he had a slender face, little dark eyes, broad forehead, great ears, thick lips and was typically looking downward. 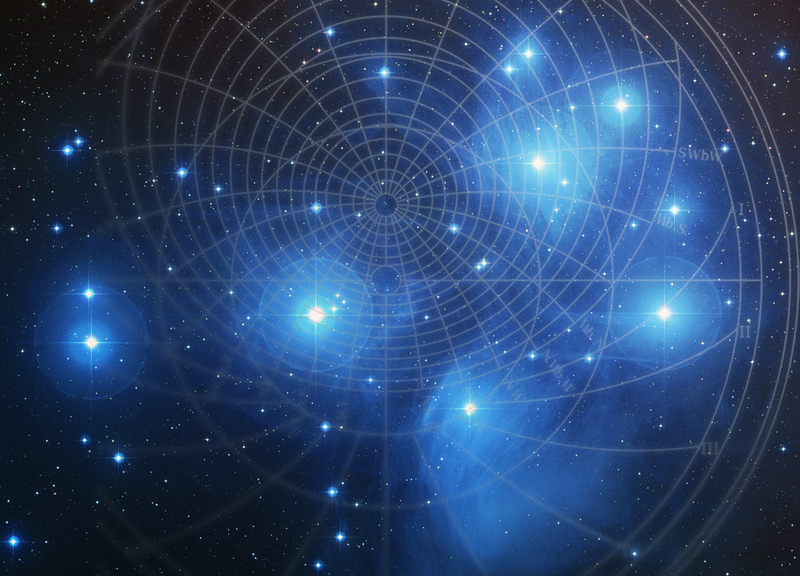 The missing brother is described by the 3rd house in Taurus and its ruler Venus. First, we have to check if the man is still alive, so we need to see if Venus casts or receives any aspect of the radical 8th house ruler (death), which is Mercury. There is no such aspect. The Moon separates from a trine to Jupiter and will now apply to a conjunction with the Sun, which generally describes “life” or “to shed light on things”. This lack of negative aspects is the best we can actually wish for in this kind of question: it means the brother is alive. Next, Lilly is asked to specify the time the brother will be heard of , but now we have to step back for a moment. 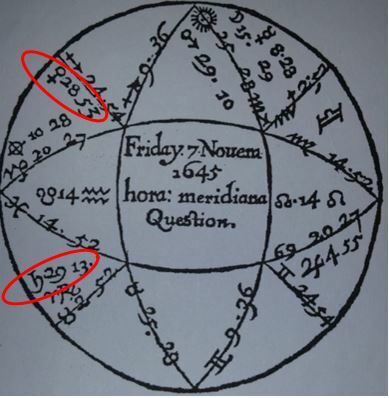 This point reveals to be very interesting: On the chart Lilly was looking at (shown right), Saturn is slightly more ahead than in the chart which has been calculated based on modern ephemerides (shown above). In the image, we can see that Saturn was at 29°13’ and retrograde, while Venus was as 28°53’ and direct. So they both apply mutually by trine. In other words, both move towards each other, which is why Lilly told his client, brother and client would meet very soon. He then checked his ephemerides in order to see, when the aspect would perfect. It was on the very same day, in the afternoon, at around 4 p.m. He advised his client to go “to the place of the carriers of those countries where he knew his brother had been”. Lilly does not explain why he says that or what kind of place this is. But we see, that Venus is in the radical 12th house, which is the 10th house from the 3rd, so probably a public place/building/square. The Moon is also on the 9th house of foreigners or people coming from distant places. Lilly was right, his client went to the indicated place and was told that his brother was alive and well. So, where had he been? 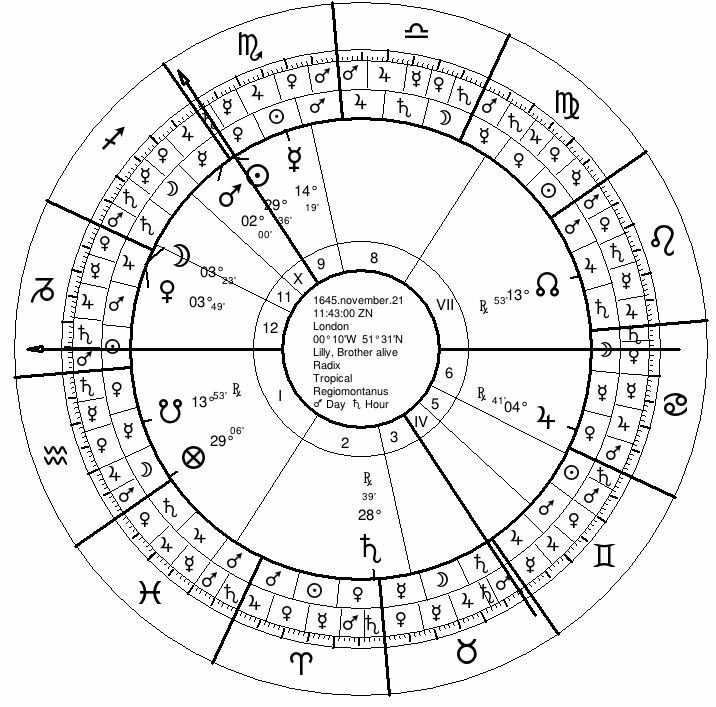 r Capricorn, which indicates South. Lilly knew from his client that his brother’s “journey was into the West” (without further specification). 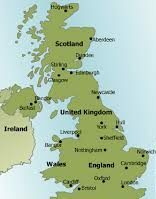 So, if we know that the client’s brother had gone westward (for example, Wales) we can say that he was in the Southeastern part of that region (for example, Southeast Wales). Unfortunately, Lilly does not give us more details about the place, where he believed his client’s brother to be. Now things are getting a little bit more complicated. When will he come back? Venus is oriental. An oriental Venus is considered to be more free spirited and used to decide on her proper terms. Venus is leaving her current sign of Sagittarius and will now enter Capricorn, where she is dignified by term and has triplicity rulership. So the brother leaves the place he has no relationship with or where he is a stranger (Venus in Sagittarius) and enters a place which is familiar to him (Capricorn). We can also see, that Venus is in the 12th house. Since the planets move counterclockwise, she is symbolically moving toward the AC (home). We have to see things in a context here. The 12th place could, theoretically, also mean “prison” or “capture”. But “prison” does not match with “increasing dignities” and “rulership”. Also, her being oriental describes Venus to take her own decisions rather than obeying anybody else. This is why her movement in the order of signs becomes so important. The fundamental point here is not her position in the 12th, but her movement towards an angle. As the brother left London several weeks ago, hours would be associated with the angles, days with the succedent houses and weeks with the cadent houses. Sagittarius is also a mutable sign, which indicates a certain quickness. This is why Lilly told his client, his brother would be back in less than 1 week. Lilly informs us, that the brother came indeed before the week was over. The question was asked on a Friday (Julian Calendar), and on Tuesday, the querent’s brother was back home. (See chart on the right). The Moon was conjunct Venus and Venus was in Capricorn in her own bounds (Ptolemaic terms) and and in her diurnal triplicity. The Moon is always the co-ruler of the quesited, in this case, the meeting of the two brothers. Whenthe Moon joins Venus (missing brother) in the Sign which rules Lilly’s client, the meeting happens. This is a good reminder, that symbolical matches only give a rough time indication, but we always have to look for real time conjunctions in our ephemerides. The 3rd house rules brothers and siblings and describes the missing brother of the client. Please remember that Lilly worked with the Julian calendar, while we use today the Greorian Calendar wich differs about 11 days. Our modern ephemerides show the aspect as just going to separate. This demonstrates, that Lilly worked within his own timeframe of his epoch, which worked out for him.